Meditab is a software used by medical professionals that offers integrated and certified electronic health records (EHR). It provides comprehensive data in a convenient, digital format so that healthcare providers can upgrade their services without compromising accuracy. The program is loaded with vital features such as practice management software, e-prescribing software, mobile EHR solutions, a careportal, practice analytics, and communication options. All of these are specialized to cater to different fields of healthcare, such as cardiology, pediatrics, ENT, pain management, and many others. 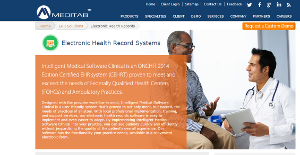 Meditab’s main EHR software works by systematically gathering electronic health information about patients. The collected data is recorded in digital format and shared across a variety of health care settings. Among the important information covered in the EHR software include medical history, immunizations, lab test results, medication history, allergies, personal statistics, and billing details. Meditab can be used by virtually all kinds of medical professionals. This is due to how the application can be customized in order to cater to different fields of medicine. There are preloaded forms commonly used per specialty. These help users save time compared to drafting them from scratch. One can begin charting even on their first log-in. Furthermore, the over 30 flexible, specialized templates that physicians can use can be easily shared with other healthcare professionals in a quick yet very organized manner. Meditab’s system ensures that patients’ information are accurate, updated, and can be retrieved conveniently. One can view a patient’s entire medical history quickly without having to go through volumes of paperwork of medical records. It also becomes less likely to replicate data erroneously since there is only one digital file per patient, which is constantly kept up-to-date. Sine Meditab is cloud-hosted, the program can be accessed anywhere there is an internet connection. It is also compatible on both PC and Apple products. This means that professionals can retrieve files virtually anytime and anywhere that they need it. However, there is also an option for on-premise deployment. Meditab boasts of client support that claims to be as committed to the patients as the medical professionals using the software. The program provides reporting tools and personalized assistance specifically useful for those working towards obtaining Meaningful Use, as the software is compliant up to Meaningful Use Stage 2. If you are considering Meditab it may also be a good idea to analyze other subcategories of Best EHR Software listed in our database of SaaS software reviews. There are trendy and widely used systems in each software group. But are they essentially the best fit for your enterprise’s special needs? A market-leading software application may have thousands of customers, but does it present what you require? For this reason, do not blindly invest in popular systems. Read at least a few Meditab reviews and think about the elements that you desire in the software such as the cost, main functionality, available integrations etc. Then, shortlist a few solutions that fit your requirements. Try out the free trials of these platforms, read online comments, get explanations from the seller, and do your homework systematically. This in-depth groundwork is sure to assist you choose the finest software application for your company’s special wants. How Much Does Meditab Cost? We realize that when you make a decision to buy EHR Software it’s important not only to see how experts evaluate it in their reviews, but also to find out if the real people and companies that buy it are actually satisfied with the product. That’s why we’ve created our behavior-based Customer Satisfaction Algorithm™ that gathers customer reviews, comments and Meditab reviews across a wide range of social media sites. The data is then presented in an easy to digest form showing how many people had positive and negative experience with Meditab. With that information at hand you should be equipped to make an informed buying decision that you won’t regret. What are Meditab pricing details? What integrations are available for Meditab? If you need more information about Meditab or you simply have a question let us know what you need and we’ll forward your request directly to the vendor.